NBA teams have adjusted the way they defend Victor Oladipo, correcting mistakes made during his breakout season. But the Pacers aren’t going anywhere, and neither is Oladipo. The cold reality of this season’s Eastern Conference playoffs is that at least one of the Raptors, Celtics, Bucks, Sixers, and Pacers won’t make it out of the first round alive. Each is an impressive team with fair reason to expect more. Milwaukee and Toronto rank among the year’s most impressive. Ask around the NBA and you’ll likely find that Boston, slow start and all, remains the favorite to represent the East in the Finals. Philadelphia has its issues, but in trading for Jimmy Butler, will begin many games with the two—or possibly three—best players on the floor. SHARP: Where Will Kevin Durant and the Warriors Go from Here? And even if some of Oladipo’s shooting has regressed to the mean, his reputation hasn’t. NBA players are savvy enough to know what’s real, and already they’re telling us what regard they hold for Oladipo and the threat of his shooting. The proof is in the coverage. Defenders have scrambled to chase Oladipo over ball screens this season, refusing to give him a pull-up jumper behind the relative safety of a screen. The nagging in an opponent’s mind isn’t the percentage, but the impression. Oladipo has only hit a third of his pull-up threes in general this season, according to NBA.com, which in itself is a relatively pedestrian figure. The difference is that Oladipo has established himself as the kind of scorer that defenders would rather not put to the test. Scouting reports and defensive best practices against a particular player are constantly changing, but for now opponents go under screens for Oladipo only as often as they do for Stephen Curry and Damian Lillard, per Synergy Sports. The book on Oladipo, so to speak, is still in its early acts. In time, it wouldn’t be surprising to find opponents trapping Oladipo—and forcing other Pacers to make critical, split-second decisions—in the games that matter most. Cleveland experimented with that very tactic against Indiana in the 2018 playoffs to mixed results. In fairness, that’s the sort of creator Oladipo has become; unless an opponent has genuinely high-level defensive personnel, ‘mixed results’ becomes a preferable outcome where Oladipo is involved. Defense is an act of concession. Every team decides what it wants to stop and it can live with, whether that’s a mismatch, a particular opponent going off, or a shot from a specific space on the floor. It speaks volumes about Oladipo that the most accepted means of defending him involve chasing him over the top of a screen as to give him a runway to the rim, or committing two defenders to trap him and allowing the other Pacers to go four-on-three in the process. If there was some corner to cut, an assistant coach or video coordinator would have found it. If there were some evident weakness to exploit, it would have been done already. Instead, Oladipo has reinforced his standing as one of the league’s most responsible attack guards: a blur with a low turnover rate, a street racer committed to using his turn signal. Efforts to diversify the Pacer offense beyond Oladipo are ongoing. As of now, Oladipo is on pace to take over 600 threes this season, up from 434 last year. Many of these new opportunities are spot-up jumpers, each proof of a possession where Oladipo didn’t have complete control. This is healthy. Once a young team establishes a star player, its next move is to relieve them. Minutes and workload are less the concern with Oladipo than diminishing returns. Some of Indiana’s most uneven offensive performances of late have coincided with Oladipo, for lack of established alternatives, taking an uncharacteristic number of shot attempts. What’s odd is that Indiana has actually been fairly competent this season in those minutes when Oladipo sits outright. Domantas Sabonis, Tyreke Evans, Cory Joseph, and Doug McDermott have staved off disaster; thanks to those four (and a rotating cast of forwards), the Pacers are closer to breaking even in their star-less minutes than at any point in the Oladipo era. Mind you that this is a small sample within an already small sample. 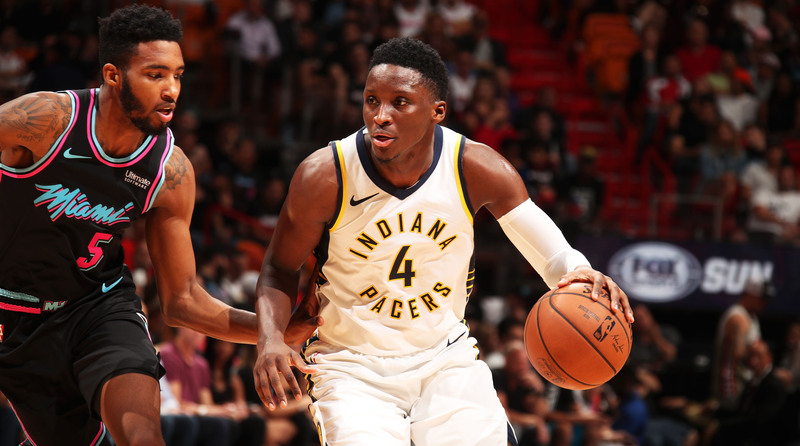 If there’s truth to that slice of performance—the kind of truth that Oladipo has confirmed in 100 games or so as a leading man—it could set Indiana free.